Heraldry in its most general sense encompasses all matters relating to the duties and responsibilities of officers of arms. 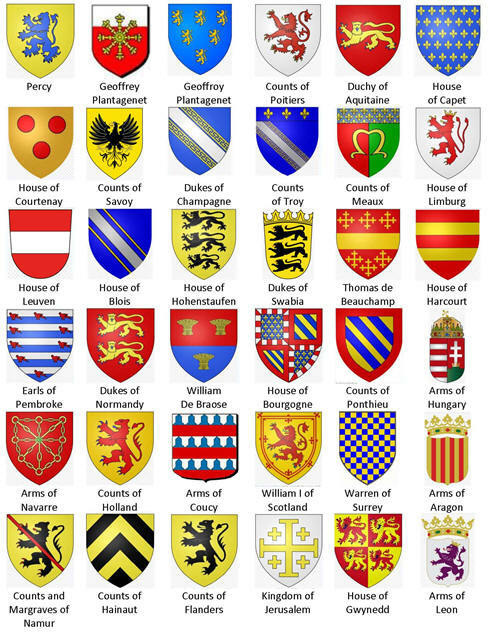 To most, though, heraldry is the practice of designing, displaying, describing and recording coats of arms and badges. The origins of heraldry lie in the need to distinguish participants in combat when their faces were hidden by iron and steel helmets. 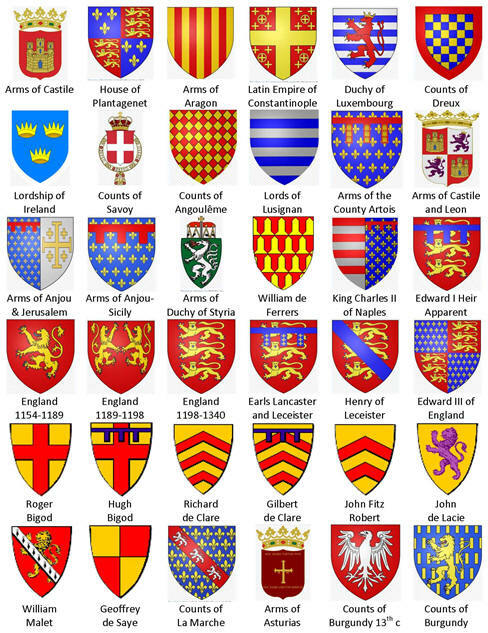 At the time of the Norman Conquest of England, modern heraldry had not yet been developed. The beginnings of modern heraldic structure were in place, but would not become standard until the middle of the twelfth century. By the early thirteenth Century, coats of arms were being inherited by the children of armigers. In Britain the practice of using marks of cadency arose to distinguish one son from another, and was institutionalized and standardized by the John Writhe in the fifteenth century. 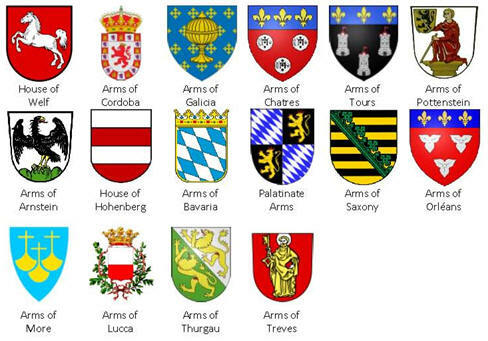 In the late Middle Ages and the Renaissance, heraldry became a highly developed discipline, regulated by professional officers of arms. As its use in jousts became obsolete coats of arms remained popular for visually identifying a person in other ways—impressed in sealing wax on documents, carved on family tombs, and flown as a banner on country homes. The idea that each element of a coat of arms has some specific meaning is unfounded. Though the original armiger may have placed particular meaning on a charge, these meanings are not necessarily retained from generation to generation. Unless the arms incorporate an obvious pun on the bearer's name, it is difficult to find meaning. The development of firearms made plate armor obsolete and heraldry became detached from its original function. This brought about the development of "paper heraldry" that only existed in paintings. Designs and shields became more elaborate at the expense of clarity. The 20th century's taste for stark iconic emblems made the simple styles of early heraldry fashionable again. The focus of modern heraldry is the armorial achievement, or coat of arms. The central element of a coat of arms is the shield. In general the shape of shield employed in a coat of arms is irrelevant. The fashion for shield shapes employed in heraldic art has generally evolved over the centuries. 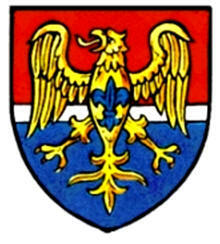 There are times when a particular shield shape is specified in a blazon. Traditionally, as women did not go to war, they did not use a shield. Instead their coats of arms were shown on a lozenge—a rhombus standing on one of its acute corners. This continues to hold true in much of the world, though some heraldic authorities make exceptions. In Canada the restriction against women bearing arms on a shield has been completely eliminated. Noncombatant clergy have also made use of the lozenge as well as the cartouche—an oval-shaped vehicle for their display. Tinctures are the colors used in heraldry. Since heraldry is essentially a system of identification, the most important convention of heraldry is the rule of tincture. To provide for contrast and visibility metals—generally lighter tinctures—must never be placed on metals and colors—generally darker tinctures—must never be placed on colors. There are instances where this cannot be help, such as where a charge overlays a partition of the field. Like any rule, this admits exceptions, the most famous being the arms chosen by Godfrey of Bouillon when he was made King of Jerusalem. There is also a separate class of charges called sub-ordinaries which are of geometrical shape subordinate to the ordinary. According to Friar, they are distinguished by their order in blazon. The sub-ordinaries include the inescutcheon, the orle, the tressure, the double tressure, the bordure, the chief, the canton, the label, and flaunches. Marshalling is the art of correctly arranging armorial bearings. 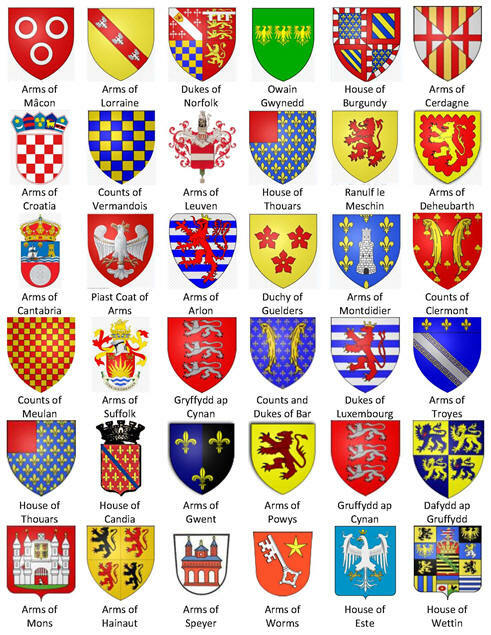 Two or more coats of arms are often combined in one shield to express inheritance, claims to property, or the occupation of an office. Marshalling can be done in a number of ways, but the principal modes of include impalement and dimidiation. This involves using one shield with the arms of two families or corporations on either half. Another method is called quartering, in which the shield is divided into quadrants. One might also place a small inescutcheon of a coat of arms on the main shield. When the helm and crest are shown, they are usually accompanied by a mantling. This was originally a cloth worn over the back of the helmet as partial protection against heating by sunlight. Today it takes the form of a stylized cloak or hanging from the helmet. Typically in British heraldry, the outer surface of the mantling is of principal color in the shield and the inner surface is of the principal metal. The mantling is conventionally depicted with a ragged edge, as if damaged in combat. Clergy often refrain from displaying a helm or crest in their heraldic achievements. Members of the Roman Catholic clergy may display appropriate headwear. This takes the form of a galero with the colors and tassels denoting rank. In the Anglican tradition, clergy members may pass crests on to their offspring, but rarely display them on their own shields. Supporters are human or animal figures placed on either side of a coat of arms as though supporting it. In many traditions, these have acquired strict guidelines for use by certain social classes. On the European continent, there are often less restrictions on the use of supporters. In Britain only peers of the realm, senior members of orders of knighthood, and some corporate bodies are granted supporters. Often these can have local significance or a historical link to the armiger. If the armiger has the title of baron, hereditary knight, or higher, he or she may display a coronet of rank above the shield. In Britain this is usually below the helmet, though it is often above the crest in Continental heraldry. Heraldry continues to flourish today in the modern day. Institutions, companies, and members of the public may obtain officially recognized coats of arms from governmental heraldic authorities. However, many users of modern heraldic designs do not register with heraldic authorities, and some designers do not follow the rules of heraldic design at all. In Scotland the control of heraldry is fully legal and the Lord Lyon King of Arms retains powers—including imprisonment, fines, and defacement of illegitimate arms. His office has no equivalent in England and is closer to that of the Earl Marshal than that of Garter Principal King of Arms. The Heineman Armorial Bearings are registered to Wilhelm August Heineman, late of Keokuk, Lee County, Iowa; the son of John Henry Heineman and Bertha Ann Heineman, nee Burger; recognized 16 January 1999 and entered in the Heraldic Register (American College of Heraldry) under Number 1778. Per fess Gules and Azure a barrulet Argent, over-all an eagle displayed wings inverted Or, charged on the breast with a fleur-de-lis Azure. Above the Shield is placed a Helmet with a Mantling Gules doubled Or, and on a Wreath Or and Gules is set for Crest, a castle with two towers Argent the port occupied by a cross throughout Gules, and issuing there above three trees in Autumn tinctures Proper, and in an Escrol below the Shield this Motto: Leadership Through Service. A "fess" is associated with the military girdle and belt of the ancients and their nobility. The red, white, and blue shield colors were chosen to signify American service. The eagle has a number of meanings. The surname Jensen is a variant of the "son of Jens" or the "son of John." Usually this has an ancient allusion to respect for St. John, who is represented by the eagle in ancient and modern religious iconography. The eagle with turned-down wings alludes to Germanic ancestry. The fleur-de-lis on a golden background (a reversal of the ancient French flag colors) alludes to Wilhelm's military service for the United States in France as part of the Allied Forces during WWI. The fleur-de-lis is representative of the Crum family origins. The fleur-de-lis is an adaptation of the lily, generally recognized as one of the most highly regarded charges with those of royalty and nobility. The three leaves of the fleur-de-lis represent courage, faith, and wisdom. The proper helmet of a gentleman's coat of arms is the "tilting" helm. A wreath or torce is common in early arms. The castle in the crest alludes to the Burger (meaning dweller in a castle or town). Growing from the castle is a grove of trees, alluding to the Heineman name meaning a man who lives in or protects a grove or forest. The trees are in Autumn colors to keep from clashing with the other tinctures. The cross on the castle port is of Germanic design referring to the Christian faith. The motto represents the family's dedication to service organizations and their leadership roles. The bearer of a coat of arms is called the Arminger (Wilhelm August Heineman) and the arms are passed to the male heirs in direct lineage. The following individuals have rightful use of these arms: Lucille Ann Dodson, Peter Edward Heineman, Sharen Lee Heineman, Bim August Heineman, Peter Lea Heineman, Chad August Heineman. The following are representative of some of the coat of arms used by ancestors of the Heineman family.